These prices are "firm," so please respect them as they are seldom shown or found by dealers. I offer vintage instruments and their related parts for the price that is listed. On my Guitar parts they are sold as is.You can ask all question before you purchase. It is your responsibility to have them properly installed by a professional. (not a weekend guitar builder) Many times these are 30 to 60+ year old Vintage items, and should be treated as such. I'm here to help you get your dream of a hard-to-find part or Strat. I find and offer the Best. Check this site out, it's pretty neat and easy to use. You can click the link on top to view my eBay items on-line now. I will be running both my web site and eBay. Best of both worlds. Playing and owning a vintage Strat is a part of me. It's never ending, and that's what We Love. This is not a Web site where you can call or ask me value of your Guitar, or what is your guitar part is worth, or if it's real etc..... There is many factors involved in many different areas. 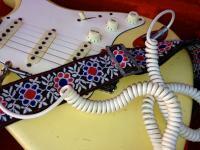 I can not or will not put my name or knowledge on another dealer/seller guitar or their item. I started a 1 of a kind service for the True Love of Fender Strat's and Gibson Vintage nut like me!